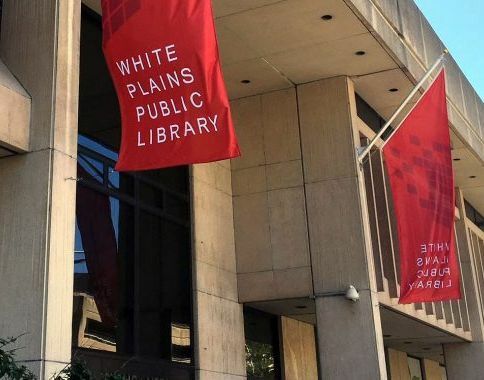 The White Plains Library Foundation is a private, nonprofit organization incorporated in 1995 to help the White Plains Public Library reach its long term goals. Through contributions from individuals, foundations and corporations, the Foundation raises funds for new programs, service enhancements and capital projects. Private support from Foundation donors helps supplement the Library’s essential public funding from the City of White Plains. Enhancements like the red flags by the front entrance, children’s furniture and much more! Co-President: Beth Kava had a career in public education, retiring as Social Studies Coordinator for the White Plains Public Schools in 2002 and the School of Education at Pace University in 2014. She is an active member of the League of Women Voters. Co-President: Diane H. Tabakman is an active community volunteer and has served on the boards of several local nonprofit organizations. Her background includes executive positions in corporate human resources and fund development. Vice President: Kristine Holden is an attorney in White Plains with Holden Brothers, PC, practicing in the areas of real estate and estate planning. She is also an active volunteer with PTAs at White Plains schools and the White Plains Outdoor Arts Festival. Vice President: Gail Schwartz is a retired middle school teacher and is a volunteer in the education program at Stone Barns Center for Food and Agriculture. Treasurer: Richard Hecht is a retired Managing Partner of Marks Paneth & Shron LLP and currently works as a financial consultant. He serves on the City of White Plains Budget Advisory Committee. Janet Bailey is retired after a career in scholarly publishing at John Wiley, Elsevier Science, Macmillan, and Special Libraries Association. She is currently a volunteer tutor for Westchester Library System and serves on the Board of the White Plains Figure Skating Club. James Benerofe is a real estate developer and editor/publisher of Suburban Street News of White Plains. Denise J. D’Ambrosio is counsel at Phillips Nizer LLP in the firm’s Environmental Law and Land Use & Government Relations practices. She is a member and past President of the White Plains Public Library Board of Trustees. Yuki Itoh Haynes is a former intellectual property legal assistant who is currently at home raising her children. She serves on the White Plains Public Library Board of Trustees. Susan Hecht is a retired nursery school teacher and Home Visitor in The Parent Child Program of WJCS. Joan Kass is an adjunct professor at Pace University School of Education, specializing in language acquisition and teacher training in world languages. Previously, she was Coordinator of Languages Other Than English (LOTE) in the White Plains Public Schools. Richard Kaye is a member of the firm of Ellenoff Grossman & Scholle LLP specializing in corporate, commercial and real estate litigation. He serves on the Boards of the Ronald McDonald House of the Greater Hudson Valley and Arts & Minds, Inc.
Brian Kenney is Director of the White Plains Public Library. Barbara R. Loucks a long-time resident of White Plains, is a former children’s overnight camp director and retired retail specialist whose volunteer activities have centered on the education and welfare of youth. Denise Matthews-Serra is President of the White Plains Public Library Board of Trustees and serves on the Foundation Board without need for election. Marjolein Mooney is retired from Yonkers Public Schools where she was a teacher of English as a Second Language. Earlier in her career, she worked for People to People Student Ambassadors leading high school student groups on international travel programs. Radina Valova is an attorney at the Pace Energy and Climate Center at the Elizabeth Haub School of Law in White Plains. Prior to joining the Center, Radina worked in commercial litigation and managed a sustainability education program in Santa Monica, California. Nicholas Wolff is a licensed broker with Better Homes and Gardens Rand Realty and a past President of the Foundation. He's an active volunteer with Family Services of Westchester, White Plains Housing Authority, El Centro Hispano, Thomas Slater Center and other groups. Nancy Rubini, Executive Director: Nancy joined the Foundation in 2016. Her prior experience includes fundraising for the Jacob Burns Film Center, Pro Bono Partnership and Building with Books, Inc. Before working with nonprofits, Nancy held various positions in the Public Finance Department at Standard & Poor's Corporation.